Why Is My Puppy Weeing Indoors? 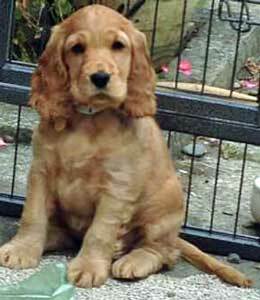 I have a cocker spaniel puppy weeing indoors despite having been previously toilet-trained. I just don't understand it. She's just over a year old and she took a long while to potty train, but we got there in the end. However recently she has had a couple of wee's inside, even though she's let outside regularly. This evening I let her outside to pee. When she returned, she came upstairs and promptly wee'd on my bed! We have had some dominance issues with her, which we have sorted, however, she is definitely the boss of my 4 year old springer spaniel. She's also a chewer, so we bought her a muzzle to help stop that. I'm just annoyed with this weeing inside business. I'm extremely frustrated and don't know what to do. I'm assuming that your vet has confirmed that your Cocker Spaniels isn't suffering from any health problems such as incontinence or other bladder issues. My Mom says this crate will help resolve my potty training problems! It sounds to me like your Cocker is still challenging you for the Alpha role. I think she may be weeing (marking) on your (her) bed. She's trying to assert her dominance over you. continue addressing her dominance issues for a little longer. You might like to read these top tips on how to be the alpha dog to give you a few more ideas or to refresh your memory. make sure she gets plenty of physical and mental exercise to tire her out. A tired dog is less likely to get up to mischief! keep her off your bed until this problem is resolved. This is my take on letting dogs sleep on your bed: Pros and Cons of Sleeping Dogs On Our Beds - I warn you, it's quite controversial! Be persistant and your hard work will pay dividends. Instead, I recommend you read this article on how to stop your puppy chewing his or her way through your home - I hope you find it helpful in addressing your puppy's chewing problem. Definitely a dominance issue - especially as she was previously fully house-trained. I think this is her way or marking her territory and telling you that she's the boss. Read the information on this website about the alpha male (or female in your case!). There's some sound advice.